In this article you will find a lot of Miniature Pinscher dog information, including care recommendations and training tips. Originally bred to be a vermin exterminator for German farmers, the Miniature Pinscher is today a highly popular house pet and colloquially referred to as the Min Pin dog. Its German name is Zwergpinscher, which means Dwarf Pincher. Despite its similarity to the bigger Doberman Pinscher, it is not a Mini-Doberman. 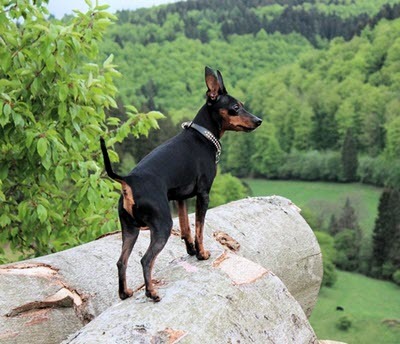 As a matter of fact, the Miniature Pinscher seems to have been around longer than the Doberman Pincher. Miniature Pinscher dog care is not a very time consuming task, because the smooth, short-haired coat requires only basic attention. Give your dog a brisk brushing every few days to keep the coat clean and shiny, and trim the toenails roughly every two weeks. Wipe the area under the eyes as soon it gets mucky. Avoid frequent bathing since this makes skin and coat dry. If your Miniature Pinscher becomes dirty, it is better to wipe it clean with a warm, damp piece of cloth free of shampoo. Since the short, smooth coat provides very little insulation, dog-clothes or shorter walks are recommended during excessively harsh weather. It is also very important to make sure that your Miniature Pinscher is completely dry after a bath before you allow it to go out in cold weather. Being selectively bred to hunt vermin, the Miniature Pinscher will chase virtually any kind of small objects – including items such as bottle caps which can pose a choking hazard. The Miniature Pinscher loves to eat and obesity will increase the risk of several health problems. An essential part of good Miniature Pinscher dog care is to provide your dog with a healthy diet and plenty of exercise. A Miniature Pinscher dog puppy can charm anyone, but before you decide to bring this little bundle of joy home you should ask yourself if you are willing to devote sufficient amounts of time, energy and money to this dog for the next 12-14 years or more. The Miniature Pinscher needs plenty of training to do well and even though it is an extremely affectionate creature, it will not appreciate being kept as a lap dog only. You must also be careful if you want to combine this breed with children. The Miniature Pinscher loves to play with children, but it is not as sturdy as a Newfoundland or Labrador Retriever and many Miniature Pinschers are injured each year during boisterous play with kids. This is true for the Miniature Pinscher dog puppy as well as for adult dogs. Children must be thought how to safely play with this energetic but fairly sensitive breed. The Miniature Pinscher is highly intelligent and will quickly learn new tricks during Miniature Pinscher dog training, but it will also use its intelligence to figure out which family members that must be obey and which family members that are not very consistent in their Miniature Pinscher training. It is not uncommon for a Miniature Pinscher to blindly obey the most stubborn and unswerving person in the household while shamelessly manipulating less consistent souls. It is therefore a good idea to sit down together and discus Miniature Pinscher dog training as a family to make sure that you all stick to the same rules. According to the American Kennel Club (AKC) standard, the aim of Miniature Pinscher dog breeding is the creation of proud, vigorous and alert dogs that are sturdy, well balanced and short-coupled. The coat should be smooth and naturally well groomed. Important Miniature Pinscher characteristics are hackney-like action, spirited presence, fearless animation and complete self-possession. The aim of Miniature Pinscher dog breeding should also be to develop dogs that are 11 to 11 ½ inches tall when measured at the highest point of the shoulder blades, but anything from 10 inches to 12 ½ inches are allowed. Since the Miniature Pinscher is a small breed, it is often sold by puppy mills that produce endless amounts of “cute” dogs to earn as much money as possible with no or little regard to the welfare of the breed, the individuals dogs and the future owners. When purchasing a MinPin, it is very important to stick to responsible Miniature Pinscher dog breeders that strive to create healthy and well-socialized dogs. 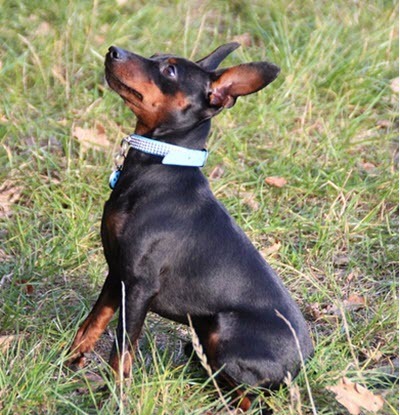 Knowledgeable and conscientious Miniature Pinscher dog breeders will strive to decrease the risk for hereditary disease in their dogs, such as Legg’s Perthes Disease and patellar luxation. (The latter is not always hereditary; it can also be caused by subsequent injury). The Miniature Pinscher dog price varies a lot and it is difficult to provide any general guidelines. Prospective buyers are encouraged to investigate what they actually get for their money, since this is more important than the exact Miniature Pinscher dog price. You should for instance find out if the Miniature Pinscher breeder has paid to have the MinPin puppy checked by a vet, vaccinated and de-wormed, or if you will be forced to pay for this out of your own pocket.